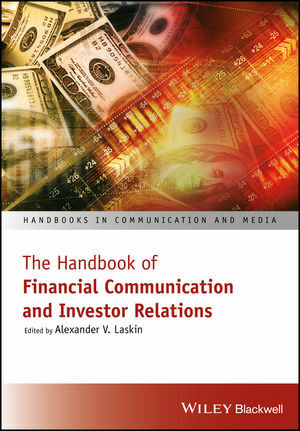 Featuring contributions from leading scholars and practitioners in financial communication and related fields—including public relations, corporate communications, finance, and accounting— this volume in the critically acclaimed “Handbooks in Communication and Media” seriesprovides readers with a comprehensive, up-to-date picture of investor relations and financial communications as they are practiced in North America and around the world. The Handbook of Financial Communication and Investor Relations provides an overview of the past, present, and future of investor relations and financial communications as a profession. It identifies the central issues of contemporary investor relations and financial communications practice, including financial information versus non-financial information, intangibles, risk, value, and growth. Authors address key topics of concern to contemporary practitioners, such as socially responsible investing, corporate governance, shareholder activism, ethics, and professionalism. In addition, the book arms readers with metrics and proven techniques for reliably measuring and evaluating the effectiveness of investor relations and financial communications. This book makes an ideal reference resource for undergrads and graduate students, scholars, and practitioners studying or researching investor relations and financial communication across schools of communication, journalism, business, and management. It also offers professionals an up-to-date, uniquely holistic look at best practices in financial communication investor relations worldwide. Alexander V. Laskin, PhD, is a professor of strategic communication at Quinnipiac University, Hamden, Connecticut, USA. He is the author of more than 50 publications, including books, book chapters, and articles on investor relations, international communications, and measurement and evaluation. Dr. Laskin's research on investor relations was recognized with the Ketchum Excellence in Public Relations Research Award. Dr. Laskin also offers consulting services in investor relations, research and evaluation, and international communications.